Ha, ha, well consider your life easier! For CM transitioning, registration is dependent upon 2 things only: unit posture and if a battery has done a registration fire mission. Artillery is either in General, Direct, or Dedicated support roles. This only determines who the arty is eligible to support, and how likely arty is to respond to FM requests from those units eligible to support. General arty can support the most units, however it is less likely to respond. Conversely, Dedicated arty is most likely to respond, but it will only respond to a single unit. Again, none of this impacts registration. Ah, the agony of making assumptions. Ok, now I can move forward with (finally) finishing the draft OBA rules, then hopefully start the actual OBs and we can start setup and play this week. You mentioned that you were not allowing registration for the attacker, and that's cool, frankly. If so, I will allow each attacking module one pre-registered hex, for barrages/planned fires only, just to allow use of these tactics, and just work around the use before/after planned fires issue, which isn't a big deal at all, really. Thanks man, this makes things much easier. I am also assuming that no registration missions have been fired by the Americans in this scenario? You are correct, the American's have performed no registration missions. They are recovering from the first attack, and are actively preparing for the next attack! In terms of CM transitioning I am of the opinion that allowing TRP's for the attacker would be too powerful with how they work. In CM you can do planned missions that land accurately anywhere on the map within the first 15 minutes of a battle. After that it is all on-call, requiring an eligible spotter and line of sight. For ASL I don't recollect how the arty rules work exactly, but it sounds like you have a great system to start from the way I understand it! I'm looking forward to see how things turn out for ya! I'm not going to go into the blow by blow of how I take the info that TO gives me and transmogrify that into ASL terms; anyone who is interested can follow along when I get around to posting the ASL version of this on the Gamesquad forum - link to follow when I get around to doing that. So using the ruleset I generated, I get the following battle area. I have taken some liberties by removing a full company from the American OB - the situation is that the Americans are reorganizing for another attack, so it makes sense that the third company would be more to the rear and out of the battle. By the magic of the ruleset, this translates to the following in ASL terms. FJ Batallion HQ – 1 x 7-0 Leader – Good old Col Klink, I guess. FJ Company – 12 x 5-4-8, 9-1, 8-1, 8-0 leaders, 6x LMG, 3x 50mm MTR, 4x PSK. 3x FJ Stug Pl – 6x StuG IIIG (L), 3x StuH 42 (L), 9-1, 8-1 Armour Leaders. 1 x 81mm MTR OBA - normal ammunition - 8-0 leader, radio/field phone. 1 x 120mm MTR OBA – normal ammunition - 8-0 leader, radio/field phone. 1x 105mm OBA – plentiful ammunition - 7-0 leader, radio/field phone. 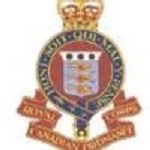 Engineer Platoon – 1x 7-4-7, 8-0 leader, FT, DC. MG platoon – full – 7-0 leader, 2x HMG, 2x MMG, 4x 3-4-6. MG platoon – depl – 9-1 leader, 1x HMG, 1x MMG, 2x 3-4-6. 1 Antitank Platoon – 3x 57mm ATG, 3x 2-2-7, 3 x 1/4 ton jeep. The objective for the Germans is to cause maximum damage to the Americans while sustaining few casualties themselves - This is really a large-scale raid to disrupt the American attack, and as such will rely on speed and firepower, especially from the StuGs, to cause damage before retreating back to their own lines - ideally this will be complete within an hour or less. This requires concentration of force, but they need to watch out for the powerful American artillery! Looks good! Fascinated to see this play out! Ok, I've gotten the American setup back, and my opponent has done a fairly decent setup. The fact that I get an on-board setup zone plus the fact that the Americans are in an exposed posture and get no Fortification point purchase means that the defence is unable to gain any concealment until after I set up. I can't inspect his stacks, but I can see what is on the top of each one, and I see a lot of MGs, mortars, and Bazookas. I forget how much firepower the Americans get. It seems like he is set up fairly evenly, with a lot of MGs to dominate the open ground in the centre of the map. I can see one of his OBA spotters, too. His AT guns do get free hidden setup, so hopefully I will not discover them with the burning wrecks of my StuGs. My plan is this. 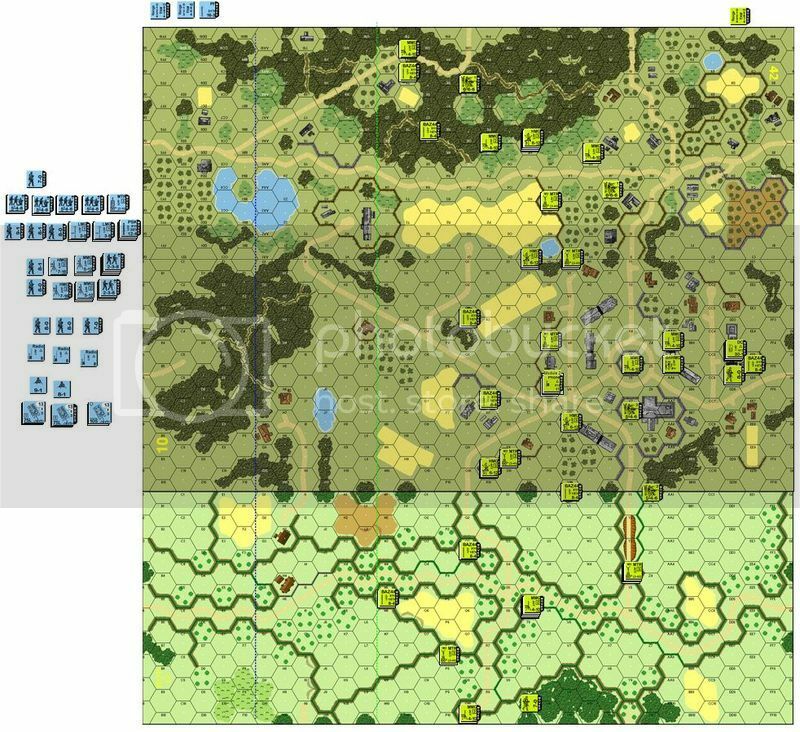 I want to try and stay away from his massive firepower in the centre, so my raid will be conducted along the eastern (right) flank through the bocage, where I can at least get some support from the AFVs, as opposed to moving through the woods on the left flank. A platoon of assault guns will support this attack, another will carefully move forward and try and interdict any counterattack over the open ground, lobbing shells at anything they can see, and the third platoon will act as a reserve. Ok, a word of caution before I begin. I will admit that I have a bit of an advantage here. Here's the thing. Because I am the one who has done all the steps that TO would do in terms of letting each side know what they have, I know what is in the American OB, and that neither side is getting any reinforcements. My oppo, however, has no idea as to my OB or reinforcement status. This is deliberate, as I want him to react a bit more historically, and not be tempted to just move all his forces and attack mine, but instead have to hold position just in case I have more attacking forces that I have either held off board or will receive as reinforcements. I want to point out that in TO, neither side will have much idea of what the other has in his OB, nor what they will get in reinforcements, except from what enemy units are potentially "in reach" of the battlefield. This will, I think, create a much greater sense of caution in players that one really only sees in ASL campaign games, which is what we want to replicate in TO. So the advantage I get here is purely an artifice of the fact that we are playtesting here - hopefully the next time we will factor some potential reinforcements into it to see if that changes how the battles fight out. So with that in mind, here is my setup. 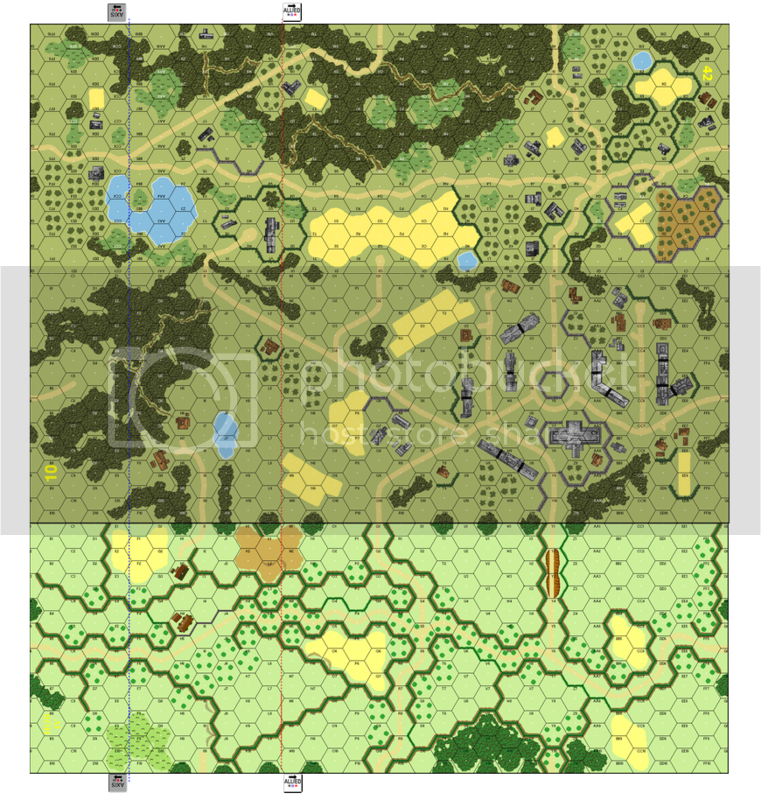 Most of my strength will attack into the bocage against what I hope is the green company, trying to cause as much damage in 4-6 turns as I can before retreating. I have 6 Assault Guns, and about 3/4 of my infantry here. The remainder, 3 AGs and some support weapons, as well as 2 of my forward observers, will move forward and set up in the woods and maybe on the hill to their front, trying to shell what they can see and interdict any movement over the open ground in the middle of the map. My OB will attempt to place harassing fires in and around the village in order to isolate the bocage area from the rest of the battlefield. I really should have used my planned fires to place these immediately, but I messed up there. Hopefully these are in place by my Turn 2. As mentioned, I am not going into a blow by blow, but once we get going, I will do updates at the end of each turn. Hopefully the first of these will be up by the end of the week. Looking great CK! Great supporting narrative on transitional aspects between ASL and TO as well. Okay, after a busy week (camping trip! ), we managed to get the first turn of the engagement downrange. 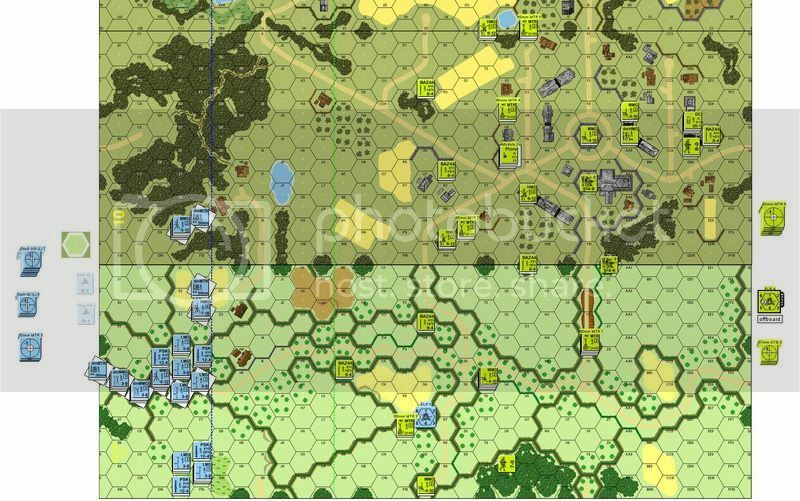 Below is the situation at the beginning of German Turn 2. It has not gone well. 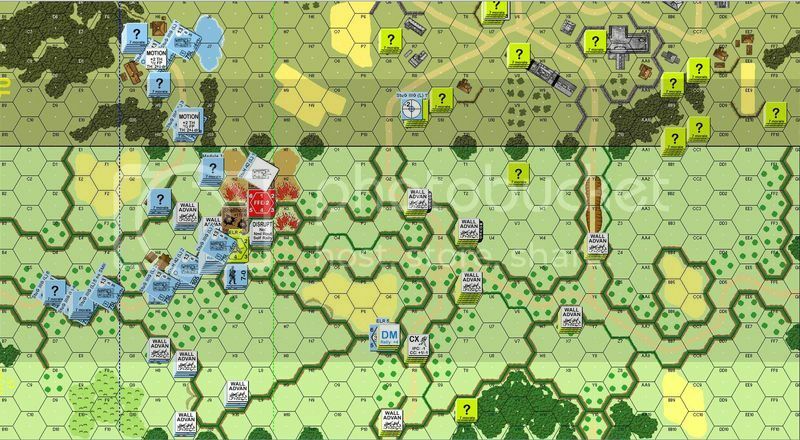 My advance has been slow, still working to get into position to spread out and attack through the bocage, while placing an interdicting force in the center to pick off and pin Americans. Unfortunately I moved a StuH 42 onto a small hill in the hope that I could see further into the depths of the American position. What I hadn't realized was that it was visible to his 155mm OBA observer. Two decent rolls brought a 155mm barrage right between an infantry stack and my StuH 42, destroying the AFV, breaking the stack, and putting shellholes in 3 hexes out of 7! Then immediately following he rolled snakes on a 4 +0 attack and KIA'd a squad and LMG. I did manage to break one of his BAZ halfsquads, but that's of no account really, as it will rally quickly. To make matters even worse, he's peeled off about half of his forces on his right (where I'm not attacking) and all his central depth troops and is swinging them over to where the action is! I will try to push forward and actually cause some casualties; hopefully I can get my arty going and my AFVs in play. But I won't push past 4-6 turns, after that I will begin my withdrawal. One thing that I forgot to mention is the persistence level for each side. Persistence is an optional mechanic that we are trying out that attempts to stop the player from sacrificing far more forces in an engagement than their real life counterparts would have done so. Basically, the player assigns a unit a persistence level in TO. This equates to a % loss level that once passed will cause a side to have to withdraw. There is a mechanic that allows a player a chance at increasing the persistence level in order to keep fighting, but this has repercussions in terms of cohesion (and manpower losses!) in TO. So the German in this battle has "cautious" persistence, while the Americans are "determined". This means that the German will be forced to break off the attack after 4% casualties, while the Americans will start to withdraw at 9% losses. In ASL terms, this is reckoned in CVP value. Each squad or crew is worth 2 CVP, and leaders are 1 plus their leadership modifier. Guns are worth 2. The German AFVs are worth 6 points apiece, crew included. The German starts the scenario, then, with 109 CVP. This means that the German can take up to 5 CVP before triggering persistence effects. The American starts with 87 CVP, and will trigger persistence at 8 CVP. The bad news is that the Germans took 8 CVP in turn 1. This means that in order to not have to withdraw immediately, I have to make an impetus dr of 3 or less in order to raise my CVP limit to 10 CVP. I managed to do this, so the scenario will continue. Should I take another 2 CVP, I will have to decide whether to withdraw, or attempt to press the attack and raise my persistence level again. Now one thing we are currently playing with is not including armour in the persistence equation. If we do this, the Germans drop to 45 CVP at start, and their cautious threshold drops to 2 CVP. The impetus roll still needs to be made either way in this case, because of the squad I lost to the KIA. Thoughts? While this is to a degree realistic, and will stop units from evaporating very very quickly in TO, I'm not convinced that it makes for fun play in the tactical resolution. I think we might up the percentage levels - infantry casualties (in ASL) can be recovered in TO immediately after the battle, and TO can have vehicles come back pretty quickly depending on the maintenance level and capability of the units in question. We want the tactical battles to be fun and somewhat decisive, but we don't want them to be too decisive, and kill off whole units. Bit of a dialectic there that we need to explore further. #3) Normalize results. If battle results fall within a certain range then no changes would be needed, otherwise results can be normalized to more acceptable parameters. The basic parameters being % casualties sustained for each side, distance of advance, and battle duration. The way I see it, they rach have their pluses and minuses. Thoughts? We have stopped halfway through the American turn 2, but will pick it back up again tomorrow or the next day. The American arty has been unbelievably lucky, and I've lost another StuG and 1.5 squads in this turn to American OBA. So now my losses are at 17 CVP, or 15.6% - 2 AFV, and 2.5 squads. This is enough to force me to either withdraw or try to push it to determined persistence at the beginning of my turn 3. If I succeed, I could continue with another 3 CVP casualties, at which point I would have to roll for impetus every turn to keep going. Seems a bit much for a limited spoiling attack. I am leaning toward adjusting the persistence percentages upward a bit for ASL (so your option #2), and then adding a modifier for a good ELR (an ASL morale mechanism, if you recall. This is rolled for at engagement start, and is influenced by unit morale and cohesion in TO). This is largely because I am including a lazarus mechanism in the reporting stage, whereby an ASL infantry casualty has about a 33% chance of not being a TO casualty, in order to deal with the squad level "resolution" of ASL, and the fact that "eliminated" in ASL terms does not necessarily mean MIA/WIA/KIA. So I think in T3 I will have to withdraw, which should take 2-3 turns, and I will report it as it happened in terms of results. We will see what we end up with, and next time I will see what happens if I up the persistence a bit. I am thinking of going from 4/9/18 for attackers to 6/12/24, with a bonus for ELR of 4 or 5, and a penalty for 0-2. This will end up with high losses, but the lazarus mechanism should correct it closer to the TO values, provided one does not lose too many vehicles. I'm a little leery of "normalizing". Why play the scenario if you are just going to plug in results based, I assume, on some sort of "victory level"? Perhaps I am misunderstanding it, but it seems like it takes away the incentive for playing the engagement out. Just a quick thought about the casualty treated for withdraw. I think this might warrant multiple battles, in order to weed out the extremes prior to adjusting. Even though the great American artillery should be massive lol, it probably will not occur like this every time. It would be interesting to see this battle played out a few times to get some metrics. Great discussion. The way I see it there is a conflict between the way we play tactical level games (fight to the bitter end) and the way that operational and RL are frequently played (make sure casulties are minimized). Finding the balance is clearly going to be important. I think toning down the tactical battle player's first instinct to fight to the bitter end would be a good thing. We should be disengaging and withdrawing much more then we do. On the other hand what you just experienced regarding on turn one the Germans experience enough casualties to cause a withdrawal does not lead to a satisfactory experience. I'm am saying that guidelines should be in place for casualty limits. On the one hand what you experienced - first turn forced withdrawal of the Germans - happened two or three times out of a campaign where there were 20 tactical battles that would be OK really. Another angle that could be considered is to have a feature built into TO that suggests when a battle would or would not be a good candidate for a tactical level game to be used for resolution. For example if there is a large attacking force and disorganized defenders the outcome is probably pretty clear and might not lead to an interesting tactical battle. Note I am not saying prevent a tactical game being used I'm saying TO could be programmed to recognize which engagements are more likely to lead to interesting tactical game resolutions. I have a question: earlier you said "Persistence is an optional mechanic that we are trying out" is that an actual ASL rule you are using?